We were invited to "Ultra-man festival" through the courtesy of Tsuburaya Production Co., Ltd.! After shouting our exciting and cheeful hooray "Go..go..Ultra-man", we had a lunch together in a square. 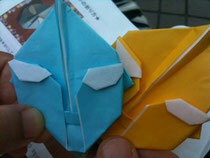 Kids were freely playing tag or creating Origami Ultra-man during/after the lunch. Upon seeing this lovely get-together scene, one of the foster parents spoke briefly. "Isn't this a fun meeting... of not only among foster-children alone, but with other children mixed. Aren't we supposed to live together anyway in real future society regardlessly". When a daughter of 2nd grader elementary school was introduced to someone else by her foster-parent, she raised an objection to the parent. "Don't you know ..my name isn't Foster-Child..I have a complete real name publicly. Don't forget". Aren't we (grown-ups) the one to blame being separating them unconsciously? -------We want to go beyond the categorical boundary of prejudice such as separating us from foster-children and he/she is from a infant-facility. We envisage this vision to be realized as one of Gruun's activities.